If you’ve been training for a while, you probably understand how important genetics are for gaining mass and getting lean. But have you ever thought what that specifically means? What genes make it so easy (or so hard) to get big? Are some people just genetically doomed to stay small and weak? What it is about the biggest guys that helps them get so strong? Testosterone! While we certainly can’t attribute every bit of muscle-building success to a single hormone, testosterone is THE key to unlocking your true potential. Those gifted mesomorphs you see in the gym – the ones who can eat whatever they want, train half-assed, and still grow – they’re like that because they naturally have super-high testosterone. Fortunately, your own testosterone-producing abilities aren’t set in stone. Even if you look and feel like a low-T guy right now, there are plenty of tweaks you can make to your diet, training and lifestyle to boost your natural production. Here a few of my favorites. 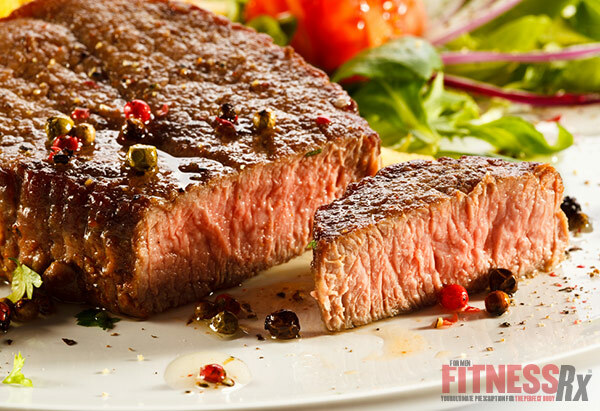 Far too many guys who lift and even professional bodybuilders focus only on macronutrients – proteins, carbs and fats. This is why bland, colorless meals like chicken and rice are so common, and why some lifters don’t bother to ever eat vegetables. Of course, muscles need protein to grow, and a steady supply of protein in your diet – at least 1 to 1.5 grams of protein per pound of bodyweight – is a requirement for putting on size. There are even some really interesting products like Velositol® that you can add to protein that doubles the power of protein on muscle protein synthesis to boost your workouts and help you build more lean muscle. The truth is, though, that vitamins, minerals and other micronutrients are also crucial in the production of testosterone and other hormones. Your body needs specific materials to produce them, and you can’t cover your bases if all you eat is meat. Some of the most important micronutrients include iodine, selenium, sodium, potassium, zinc, magnesium and vitamin D-3 – and we’re barely scratching the surface. To up your intake of all these vital nutrients, start eating tons of fresh vegetables with every meal. Most veggies contain hardly any sugar or starch, so more is almost always better. Another way to boost your micronutrient intake is to spend some extra money on grass-fed, pasture-raised animal products. Beef and eggs can be fantastic sources of B vitamins and healthy fats, but only if they’re fed their proper diets. Low-fat diets are truly terrible for those who want to gain size naturally. Study after study has shown a positive correlation between fat intake and testosterone production, so get your grub on with steaks, eggs and fatty fish. Contrary to popular belief, saturated fat is actually good for you if it comes from quality sources, so don’t be afraid of butter or coconut oil, either. It’s the hydrogenated trans fats you’ve really got to avoid. Carbs: Do you Really Need Them? If you’re going to be eating more fat, do you really need all those carbs? Carb needs and tolerance will vary wildly among individuals, so you’re really just going to have to test things for yourself. In general, I find it best to limit carb intake to the pre-, intra- and post-workout periods – the times when you know your body can put them to good use. Don’t gorge on potatoes and rice all day, but don’t go too low on carbs, either – at least not for days on end. Ketogenic diets can be useful for fat loss, but in the long run they will lower your production of thyroid hormone – one of the primary controllers of testosterone. You might not want to hear this if you’re already on the chubby side, but body fat is a testosterone killer. More specifically, high levels of body fat will cause you to CONVERT testosterone into estrogen. You’ll end up with low T and high E – a double-whammy for BURNING muscle and BUILDING fat. If you want that next mass-gaining phase to really go well, focus first on getting lean. In addition to a clean diet, consistent and hard training, cardio as well as drinking plenty of water, supplements can help you get lean. Look for a product that contains Velositol® as it will enhance insulinogenic function to boost amino acid uptake into muscle cells to fuel muscle protein synthesis. This promotes leaner body mass and increased muscle-building activity after exercise. There’s a good reason why high-T, confident guys don’t stress much. Both chronic and acute stress will raise your cortisol levels, which in turn leads to less testosterone production. Low T and high cortisol make it easier to get upset, and you end up in a stressful cycle that’ll kill your gains. Stress really is a killer – so try to chill out! Minimize the negative influences in your life, and practice meditation and other calming exercises. Focusing on the heavy, compound lifts like squats, deadlifts and presses will really boost your natural T. In fact, a full-body routine or powerlifting split will probably be best for optimizing your hormones. These workouts will definitely deliver results if you want to boost T levels. And beware of overtraining. Doing endless sets and reps with hardly ever a day off is a great way to overtrain and wreck your hormone levels. Most people won’t cross that threshold, but there is a point where you’ll see diminishing returns from hard, heavy training.